If repetition is good for the soul, as they say, then I'm doing some good soul building. These days I have the urge to explore the same subject in multiple ways. I wonder why? Is there is more to learn? Is it that I can't let go of the subject until I've painted it out of my system? So it is with Church Rock. It's stuck in my head like a bad commercial jingle; only I’m content to let it stay there a while. My second run at the rock resulted in an acrylic painting on watercolor paper. 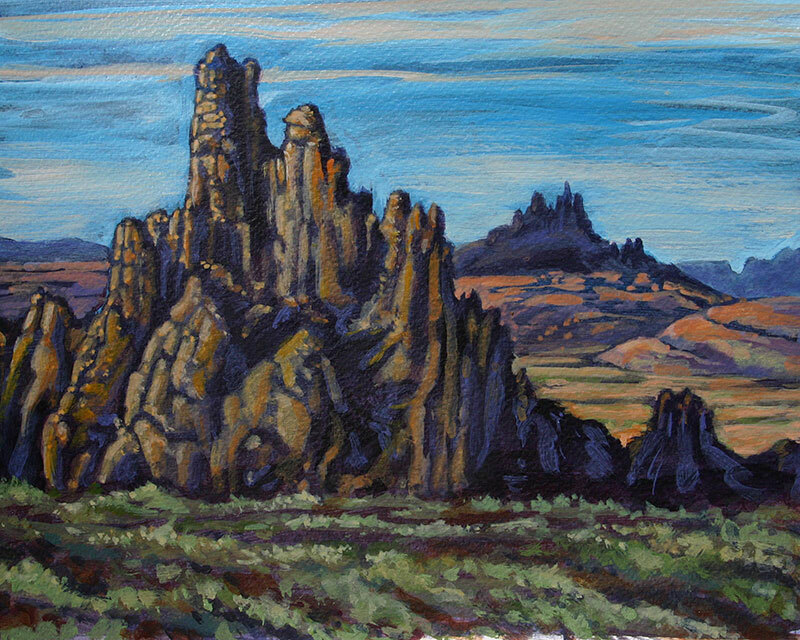 It is much smaller than the first piece, only 10" X 8" as opposed to 24" X 18". I think it packs a punch in its own diminutive way. Acrylic on paper is a lot of fun. You can get rich, dark tones without tedium of building it up in layers of watercolor, which always tends to dry lighter than expected. Acrylic affords the delight of transparent colors and glazes, yet you don't have to worry about lifting color or overworking the paper. And, one of my favorite things, you can break the art rules by adding white back into a piece—something strictly verboten in watercolor. Oh, you can do it. But there are risks. I knew a guy the art police put away for years for that—using opaque white in a watercolor piece. But then, he was an illustrator and they just can't help themselves. Illustrators use whatever it takes to achieve an effect: coffee, ashes, onion skins, gauche, carbon dust—wildly combining media and whatever is at hand. I trained as an illustrator, so I can say these things. I've combined all kinds of odds and ends to render something just right. The White Thing was big around the art department when I was in college. On the fine art side of the fence they rallied for the purity of the materials. There was no integration of transparent and opaque paint. There were a few rule-breakers, but the purists ruled the land in those days. On the other side of the debate, the devil-may-care illustration gang—always looking for new ways to combine materials that broke “the rules”. My studies stuck me between the two camps. I felt vaguely guilty when working on my illustration projects—the fine art police at the back of my mind. Yet, illustration gave me the freedom that fine art forbade. I lived in two worlds. Sometime after college, I decided it was worth the risk to use white in a watercolor piece, which led me to experiment with acrylic on paper. My first piece was waterfall in a deeply shaded canyon. It was the perfect subject for acrylic on paper. The rocks were painted loosely and transparently. The shadows moved from transparent layers to deep opacity. And then, I gleefully painted the waterfall in opaque whites tempered by transparent blues. It was wonderfully brilliant against the background, with all the drama an illustration can muster, yet appropriately fine artly executed. I grew more confident. Sure, I had some terrible failures, but I learned how to judiciously use opaque white in my works on paper. I then realized it was not the art police that I needed to fear. The anti-white edict was for our own protection. It was to make us better artists, to grow our skills with transparent media. To teach us joy in the purity of the white of the paper, to appreciate the texture, luminance, and interplay of light. It taught us to mix the perfect value and apply the paint mindfully.